New Zealand maintained their dominant position in this year's cricket world cup as they defeated Afghanistan by six wickets at home in Napier on Sunday. 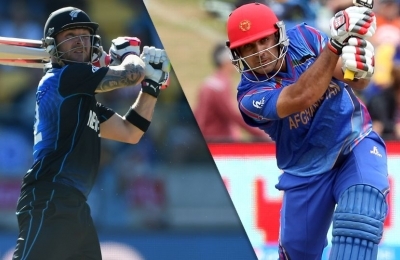 It is New Zealand's fifth consecutive victory and the fourth consecutive defeat for Afghanistan. Afghanistan batted first and were bowled out in 47.4 overs, setting the target of 186 runs for New Zealand to chase. In response, New Zealand scored 188 for four with 83 balls remaining in their innings. Najibullah Zadran scored the most runs of his team with 56, followed by Samiullah Shenwari with 54. For New Zealand DL Vettori was the leading wicket taker with four, followed by TA Boult with three, CJ Anderson with two, and AF Milne with one wicket. MJ Guptill, with 57, was the leading run scorer for New Zealand followed by BB McCullum with 42, KS Williamson with 33, LRPL Taylor with 24, GD Elliott with 19 and CJ Anderson with seven. Elliot and Anderson remained unbeaten leading New Zealand to victory. Shapoor Zadran and Mohammad Nabi for Afghanistan got one wicket each. After this game New Zealand have advanced for the knock-out stage while Afghanistan has been eliminated. It is Afghanistan's first world cup, claiming their first win over Scotland earlier in the tournament.